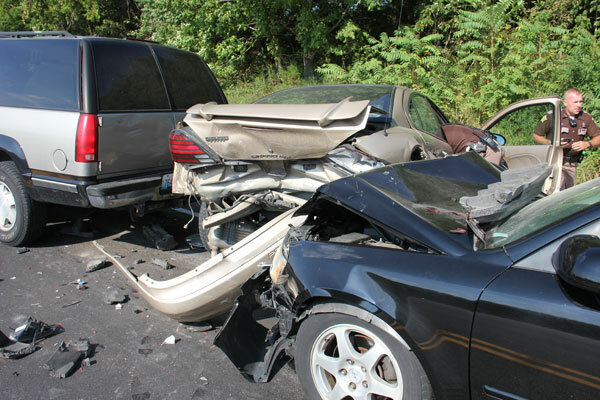 A two-vehicle collision Thursday morning resulted in the Adair County Fire Department extricating one person from a vehicle with the jaws of life. 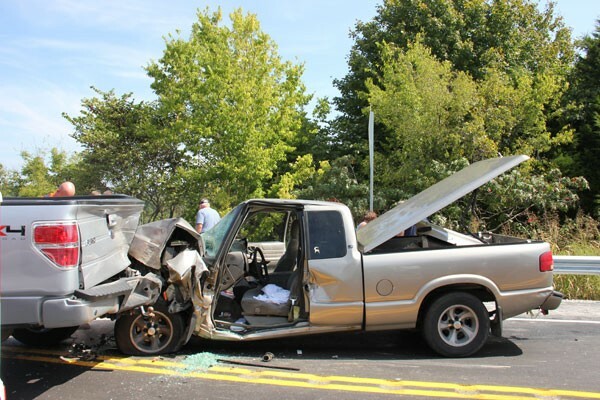 Thirty-one year old Brandon Jones of Russell Springs was operating a 2000 Chevrolet north bound on Ky. 55 N. when he rear-ended 67 year old Larry Godsey of Columbia. Although there were no injuries, Brandon Jones was trapped in the vehicle and had to be extricated. North Ky. 55 was partially closed for nearly one hour. A passenger in the Jones vehicle, 34 year old Doris Nethery was complaining of chest pain, but refused transport by Adair County EMS. 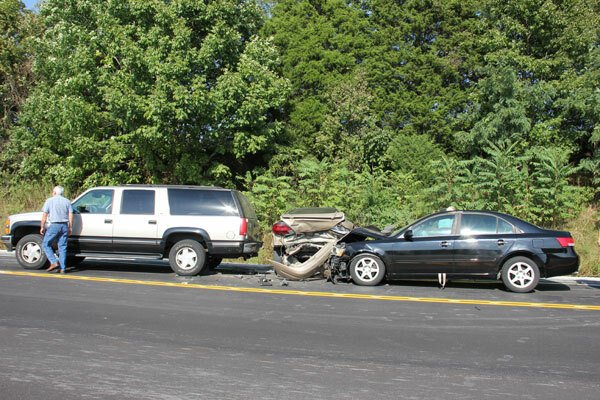 Deputy Aaron Rainwater and Sheriff Harrison Moss investigated the collision. 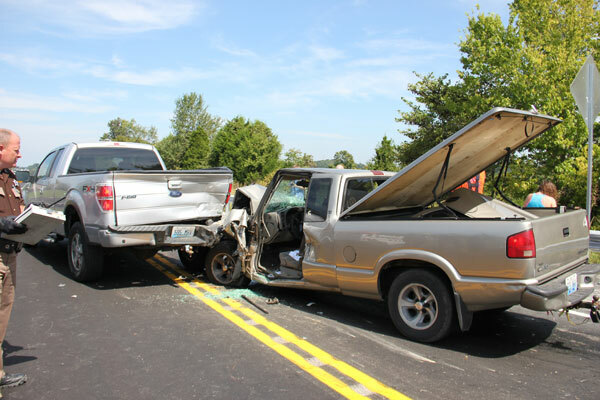 On Thursday at 3:30 pm Adair County Sheriff’s office responded to a three vehicle injury accident about 6 miles north of Columbia on Hwy 55 N. Upon arrival, 74 year old Larry Harrah of Campbellsville was stopped in the roadway in his 1999 Chevy suburban due to construction work on the roadway. Witnesses state that a second vehicle stopped behind Harrah being a 2006 Pontiac Grand-am operated by 49 year old Ronald Gadberry of Columbia. Gadberry also had a passenger in his vehicle, 22 year old Dillion Burton of Columbia. Witnesses state that a third vehicle, a 2006 Hyundai Sonata operated by 21 year old Alisa Johnston of Leitchfield failed to stop in time and struck the Gadberry vehicle causing it to strike the Harrah vehicle. Passenger in the Gadberry vehicle, 22 year old Dillon Burton was treated on the scene by Adair County Ems and transported to TJ Hospital of Columbia and later airlifted to University of Louisville Hospital for injuries sustained. All other victims in the crash refused medical treatment. Deputy Hitch is the investigating officer assisted on the scene by Sheriff Harrison Moss and other emergency personnel. Sheriff Moss would like to remind drivers speed would be monitored by radar on Hwy. 55 and drivers are urged to drive the posted speed limit and keep in mind that there have been lanes added both north and south bound. Numerous complaints have been made about speeding motorists in the area.